After much soul searching, I'm finally ready to write something on the topic of the democratic primary - one of the most fascinating and important culture struggles of our day. The government and major cultural institutions should make a big effort to throw off gendered norms and preconceptions of the past and thus work towards a world in which women are treated as people and no different from men. Men should be banned from running for President. Men should be banned from being CEOs and directing movies. Men should be forced to say the words "I'm so so sorry for the patriarchy" once per hour. In fact, for the next generation or so, men should be forced to live alone in glass cages with nothing but a daily supply of bread and water, wearing collars that give them an electric shock if they fail to intone the ritual apology at the appropriate time. You think I'm joking. You think these ideas are extreme. You're wrong - these ideas are MILD. You have to consider the context. Women have been brutally oppressed for a hundred thousand years. All I'm asking for is that men sacrifice one generation - a mere speck in comparison! Plus they get to live, albeit naked and writhing in the apology torture cells, safe in the knowledge that although their lives are forfeit, at least their children will get to grow up in a world free from inequality. That's a luxury no woman has EVER had. So...that's my view on how to achieve justice. But I'm a pragmatist. I realise that while my views are reasonable and restrained, others view them as fringe. No presidential candidate is going to run on a platform of dystopian patriarchy reparations, so I'm going to have to compromise. What are my alternatives? I have Bernie Sanders, who is the first successful politician of recent decades to actually suggest some good ways to run the country a man, and I have Hilary Clinton, who is an extraordinary example of female strength in a system where everything is stacked against her a woman. The powers of the President are super limited. Bernie is more likely to lose to a Prince of Darkness Republican. And his presidency would ensure the Spawn of the Netherworld Republicans keep Congress for another 8 years. The idea of another old white man winning enrages me so much that I want to pull my corneas off. Everything about the response to Hilary's success, the loathing of her out of all proportion to her faults, confirms the fact that the system needs to change and change big. Perhaps these points make you think that I like Hilary simply for being a woman. I am happy to confirm this is the case. I am FLABBERGASTED that it wouldn't be the case for everyone. Is it super stupid and patronising and arguably counter-productive to vote for someone because of their gender? YES. But this is the person I am: a person so rabid that I would do anything to have a female President. It's the person that a lifetime of living in a horrendously unequal world has made me. The kind of person that I believe is the only reasonable response to the aforementioned hundred thousand years of mind-boggling oppression of half the goddam species. I would commit the cliche of comparing it to the Third Reich, except for the fact that the patriarchy utterly DWARFS the Third Reich. 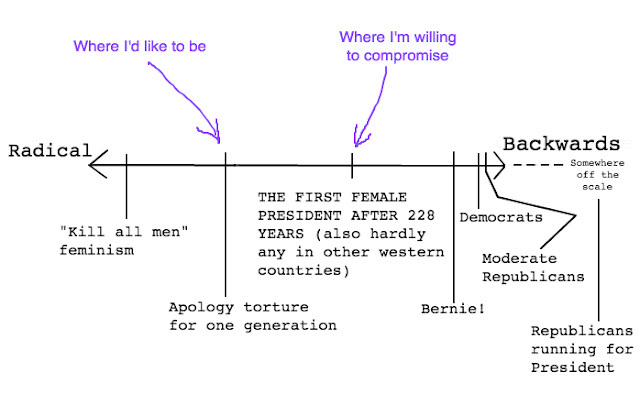 I read a really great piece recently that argued that many older feminists feel that Hilary is "entitled" to the Presidency because they've waited so long for it. It said that Bernie's young feminist supporters don't owe Hilary or the old feminists anything. But for me, Hilary is entitled to the Presidency not because she's worked for it all her life - having to play the horrible game and be way better at it in order to get anywhere - but because she happens to be the only woman running. HUMANITY is entitled to a female president, not just Hilary or older feminists. Humanity is CRAZY ENTITLED. And it's lucky that Hilary is there to fulfil that entitlement. Seriously. Unless I'm wrong, and I am never wrong, they are headed dead into the fire swamp gender equality is THE biggest issue of our times. It ties into every important cultural shift that we need to achieve if we're going to have an awesome society in the future. Having a female President can do so much more good than any well-intentioned candidate ever could. And conversely, NOT having ever had a female President - in 2020 for christ's sake! - is just incredibly harmful towards overall progress. Joy will be the second greatest emotion I feel when Hilary becomes President. Relief will be the greatest. Very interesting and funny. My only question is, where is the evidence that women have been brutally oppressed for a hundred thousand years? We have documented evidence of female oppression for 5,000 years, and we can even extrapolate this to about 10,000 (there is token data that suggests that the shape of "V" has meant "female" for 6,400 years (https://www.researchgate.net/profile/Jennifer_Ball4/publication/269700358_V_female_for_6400_years/links/54c7060a0cf22d626a360eb1.pdf?inViewer=0&pdfJsDownload=0&origin=publication_detail). Prior to this (and the advent of writing) burial accoutrements suggest that women were equal to men, or perhaps some had slightly more power. I would be interested in your source material.